The abundant gold and turquoise of Samar Hussaini’s mixed-media paintings suggest earth and minerals. But the New Jersey artist is primarily inspired by the thob (or thwawb), the traditional Arab tunic whose embroidery denotes its regional origins. “Resilient,” the title of Hussaini’s Gallery Al Quds show, includes two stand-alone versions of a thob, as well as pictures that incorporate its design motifs. Hussaini’s one-dimensional work, rendered in paint, pencil and charcoal, picks up the thob’s patterns and sometimes depicts its billowing shape. Although abstract, the pictures incorporate text, architectural features and bits of found images, which are printed on the canvas. 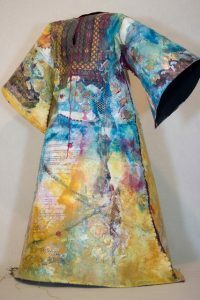 Some pieces include stitching, which evokes not only traditional needlework, but also mending in a metaphorical sense. All of these elements embody the layers that constitute an individual’s character, Hussaini has said. They might also represent strata of history, society and culture. Resilient: Samar Hussaini On view through July 28 at the Jerusalem Fund Gallery Al Quds, 2425 Virginia Ave. NW. 202-338-1958.